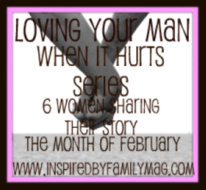 Our month long series will come to an end next week with, Part 8 of Loving Your Man When it Hurts. If you have been following along and counting, yes it did go from 6 to 8 women sharing! I have been greatly blessed by this series and I know from reading your emails and comments that many of you have also been encouraged. I am so thankful that He redeems our pain and uses it to refine us, encourage others and bring Him Glory! Be encouraged sister and let’s keep lifting our man up to our Lord, who gives strength, forgiveness, salvation, grace and wisdom. I wanted to thank some wonderful bloggers who partnered with us in getting the word out on our series. As many of you know, blog space is money so it’s not easy to just give it away. Gracias, to these sweet ladies for sharing their blog space and readers with me by putting the word out about our series on their blog! If you’re stopping by for the first time make sure to sign up to receive updates on the right sidebar to stay updated. I encourage you to go back and read some of the stories you missed, go here. Feliz Navidad From our Family to Yours!